Local shares ended the week on a more positive note in a trading session dampened by the closure of American markets for Thanksgiving overnight. "This meant thin trading volumes across the globe, but no pause in the wild swings that have been characteristic of recent sessions," noted London Capital Group research head Jasper Lawler. The benchmark Straits Times Index (STI) rose 11.11 points, or 0.37 per cent, to 3,052.49, with gainers outnumbering losers 196 to 175. Turnover came in at 1.1 billion shares worth $530.9 million. "Overall trading activity has been in holiday mode, but this belies the fact that next week could be an absolute attention grabber," said Mr Stephen Innes, head of Asia-Pacific trade at Oanda. This is a reference to the Group of 20 meeting in the Argentinian capital of Buenos Aires from Monday. The event could be fiery, with the increasingly bitter US-China trade war bound to be in the spotlight, although there are also hopes of a breakthrough. Singapore Airlines propped up the index, gaining 1.8 per cent to $9.52 on news that its budget arm, Scoot, will take over several SilkAir routes over the next two years. Singtel also did its part for the STI with a 0.6 per cent gain to $3.12 on the back of news that it is retaining its Premier League broadcast rights until May 2020. UOB Kay Hian analyst Jonathan Koh noted that the stock is well supported above the $3 mark, with its "defensive nature" perhaps providing renewed interest among investors. It has a "buy" rating on Singtel, with a target price of $3.90. OCBC Investment Research also has a "buy" call with a target price of $3.95, while RHB has a "neutral" one at $3.22. After losing some steam on Thursday, all three local banks bounced back yesterday. OCBC Bank advanced 0.8 per cent to $10.89, United Overseas Bank added 0.6 per cent to $24.03, and DBS inched up 0.3 per cent to $23.08. 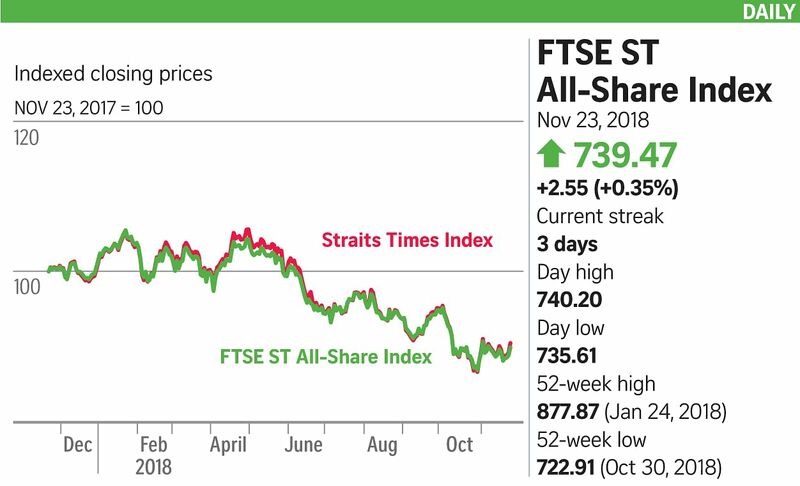 The STI's main laggards included CapitaLand Mall Trust, which lost 0.9 per cent to $2.22, YZJ Shipbuilding, down 0.8 per cent to $1.24, and ThaiBev, which lost 0.8 per cent to 65.5 cents. Elsewhere in Asia, Chinese shares led the slump as the Shanghai Composite plunged more than 2 per cent. Stocks in Hong Kong, Taiwan and South Korea also fell, while Australian shares held on to gains.